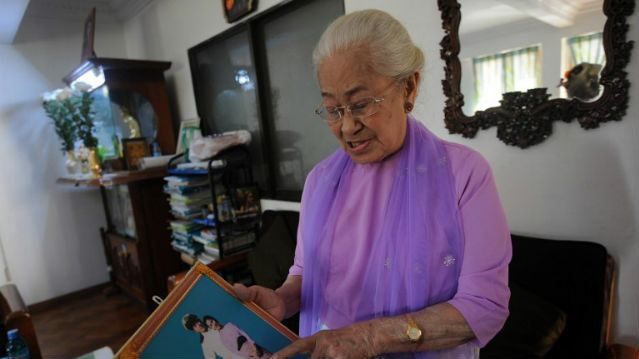 Phaya Gyi her photo during an interview at her residence in Yangon. YANGON, Myanmar – In a modest Yangon apartment, the granddaughter of Myanmar’s last king lives poor and unrecognized by her neighbors – a far cry from the power and riches of her ancestor. “They didn’t want us to be somebody,” said the silver-haired princess, swathed in a shimmering purple shawl worn especially for the rare interview. “I have lived as an ordinary person for 60 years,” she told Agence France-Presse. “Of course I repent a little over the glorious times that we had when we were young,” she said, displaying a lively wit undimmed by her 90 years. “Most of Myanmar has forgotten about the king,” said deputy culture minister and royal historian Than Swe, who has spearheaded a campaign to return Thibaw’s body to Myanmar. A visit by President Thein Sein to Thibaw’s tomb in Ratnagiri during an official trip to India last December reignited interest in Myanmar’s monarchy. But Than Swe said Myanmar’s government had more immediate priorities, such as the sweeping reforms implemented since junta rule ended in 2011. Queen Suphayalat’s tomb in Yangon is barely marked. When the family tried to place a simple sign there to inform visitors of the pedigree of the occupant, the former junta immediately removed it. “This man was a demi-god in Burma. He was worshipped by his people,” said Sudha Shah, author of “The King in Exile: The Fall of the Royal Family of Burma”. There were also doubts over finding a pliant royal heir that the British could rule through — Thibaw and his queen notoriously executed dozens of potential rivals for the throne. But one episode when the military tried to enlist the royal family to help it counter communist insurgents ended the generals’ enthusiasm for the monarchy, Shah said. “So taken aback were the generals by the depth of public sentiment demonstrated for the royal family, that they no longer involved the family in any further campaigns,” Shah said. The family had a brief period of public activity when the princess and her siblings set up the “Miss Burma” beauty contest — she was in charge of catwalk training. The royals, refusing the small allowance offered after the British left, were forced to make their own way in the world. The princess used the impeccable English she learned as a child studying in a Catholic school in the southern city of Mawlamyine to land positions at both the Australian and US embassies before settling as a teacher — a job she still does today. But a family quarrel in the late 1990s saw her lose her inherited home and end up living “in a hut”. She is “grateful” that Thein Sein took the time to visit Ratnagiri but believes her grandfather should not be moved. Several members of the family scraped together the money to travel to India in the early 1990s — her only visit to her grandparents’ home in exile. She recounted her own mother’s stories of the queen standing on a balcony overlooking the Arabian Sea and weeping for her homeland.